This new Bolt DVR may not totally remake the recording technology TiVo is famous for, but it introduces a sharp departure in design and adds features customers have asked for since it started in the late 90s. Just like the leaks suggested, the Bolt is a funky arc-shaped white box that looks different from anything else near your HDTV. Despite being smaller than TiVo’s older DVRs — or whatever cable box you probably have — it’s eye-catching enough for visitors to stop and ask what you’re watching TV on. Looks aside, Bolt’s main claim to fame will definitely be its ability to bypass commercials with a new SkipMode (No more hidden 30 second skip! We’ve been asking for this since 2009). That’s actually an old trick, and while it’s appreciated, where I see evidence of TiVo looking towards the future is the way it’s connecting the DVR to Amazon’s Fire TV. Let’s start with the new hardware. TiVo Bolt will replace the base Roamio (and eventually the Plus), as a 4-tuner DVR that also works for OTA or just streaming TV. For those who prefer six tuners and a larger built-in hard drive, the Roamio Pro will stick around, but it doesn’t have the Bolt’s 4K or new features. Bolt loses the old analog video outputs and offers only an HDMI port — no breakout cable either — which shouldn’t be a problem in 2015, but is worth knowing. It has the same integrated TiVo Stream features we dug on the Roamio, and it will work with the existing TiVo Mini boxes to extend the setup beyond your living room. That funky arc shape isn’t just there to stick out visually however, as VP Jim Denney told us it also allows the smaller box to vent from the bottom. It’s a rather unique design, and in our short time using it the box stayed cool and quiet. The upgraded hardware is good for more than just pixel-pushing too, with apps and menus responding faster than ever. One tweak you’d almost miss? 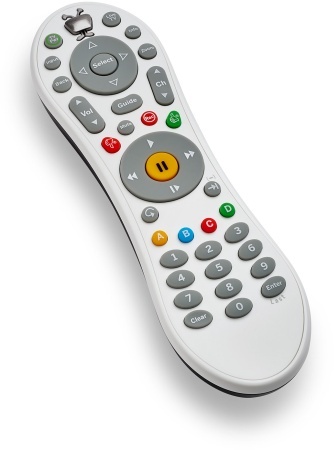 It still has the Roamio Pro’s tiny Remote Finder button on the back, perfect for times when the RF-connected control has slipped between couch cushions somewhere. In general, things are the same as they ever were, including stuff like CableCARD setups, and transferring your Series Recordings via TiVo’s sometimes-frustrating website. That’s definitely one aspect that could use a 2015-style makeover to resemble modernized platforms like iOS, Xbox or Spotify.